Ray Donald Perry was born on June 23, 1937 in Scott County, Kentucky, the fifth of eight children of Walter Brown Perry and Eula Hutton Perry. 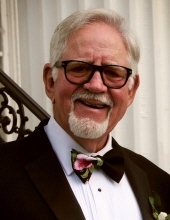 On Thursday, February 7, 2019 he was called to his Heavenly home leaving his devoted wife, Joyce Wagner Perry, three daughters and one step daughter, their husbands and children, three sisters and an astonishing number of friends. The world is a much better place because he lived and much sadder by his absence. A gifted singer and athlete in school, Ray was best known for his quick wit and intelligence, and was nicknamed "Brainy" by his classmates. Though he always regretted being unable to finish college, he made it possible for his oldest daughter, Debbie, to become a physician, his middle child, Donna, a veterinarian and his youngest, Denise, an early retiree from Toyota. Due to his encouragement and support, his children have made life better for thousands of others. He found his greatest love in mid-life when he met Joyce. Together they laughed, danced, traveled the world and loved one another through 36 years and she was his strength and joy through his difficult final months. Following his retirement from IBM, they traveled from the pyramids in Egypt to Alaska and hundreds of places in between and were able to spend unforgettable time with friends and family. The joy in their lives were their grandchildren, John, Caleb, Carson, Devin, Katharine, and Rebekah. The loss of his guidance, wisdom, numerous stories, humor and unconditional love will be felt by all who were blessed to be part of his life. No brief summary of his life can do him justice. He is survived by his devoted wife, Joyce, his daughters Debbie Perry (Tim Kelly) of Pensacola, FL, Donna Wilson-Parr (Jim Wilson) of Williamstown, KY, and Denise Bussell (Avery) of Georgetown, KY. His stepdaughter Melody Kroll (Bobby) resides in Richardson, TX. Surviving siblings are Joyce Perry and Linda Perry of Georgetown, and Shirley Berry of Phoenix, AZ. Special friends include Marshall King, Jim Parr, Rick Fisher, Joel Moody, Bill Barrow, John Barker, and Welch Cassity. He was preceded in death by brothers, Bill, Harold, and Doug, and sister, Wanda Perry. His loss is felt by other relatives and friends too numerous to mention. His wife and children wish to extend their gratitude to his oncologist, Scott Pierce, MD of Lexington and to all who sent cards, letters, recordings and love to support and comfort him. Visitation will be 3 to 6pm on Saturday, February, 9, 2019 at Tucker, Yocum & Wilson Funeral Home with service beginning at 6pm with The Rev. Nancy Farley officiating. Memorials in Ray's name may be made to Bluegrass Hospice Care. Online condolences maybe expressed to the family at www.tuckeryocumwilson.com. To send flowers or a remembrance gift to the family of Ray Donald Perry, please visit our Tribute Store. "Email Address" would like to share the life celebration of Ray Donald Perry. Click on the "link" to go to share a favorite memory or leave a condolence message for the family.